The Whittlesford Society has been involved in 2 very happy occasions at the Old School Studio – eg. 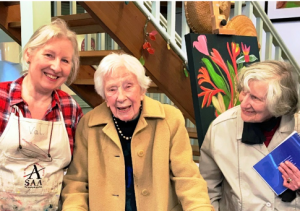 when proprietor & resident artist Val Pettifer (left in the picture) welcomed 101 year-old Mrs Peggy Simmonds, the former Infants mistress & deputy school head, along with Pat Carter (right in the picture) as well as three other former teachers to one of the unique Drop-in-&-Paint Days that have proved so successful, Val is now adding another day to the Thursday and Friday groups, as well as workshops and exhibitions also held there. Pat, a WhitSoc Vice President whose children were at both schools and who had a key role in the move to William Westley and its grand opening, had joined Peggy, ‘Miss Snell’ (Penny Brown), Miranda Harper and her daughter Catriona Harper Osman earlier as guests of Paul Bryant at a special Sport Relief Assembly followed by a tour of the current school and lunch with pupil members of the School Council. All agreed it was an especially memorable day and thanks to Val we’re delighted to be able to share it more widely soon! Earlier that month, the Whit Soc committee visited Old School Studio to toast Val and her husband Dave (Facilities Manager) on five years here and a renewed lease. As our report to the Annual Parish Meeting highlights, on Tuesday 17 July, all can now see what so impressed us – with a fascinating introductory talk, a tour/explore of the old building (including Essex Framing Services’ work- shop, gallery and treasure-trove gift shop) plus a chance to preview the Cambridge Open Studios’ work and enjoy Old School Studio’s delightful little garden to socialise and reminisce over a drink and nibbles. Other progress & plans for the year ahead will be expanded at the Annual Parish Meeting on Tuesday 22 May – for marking the centenary of WW1 ending; ideas to celebrate 20 years since the rebuilt Memorial Hall opened; and exciting opportunities to get out and about, around and beyond the village.